We must realize that it is very hard to save a civilization when its hour has come to fall beneath the power of demagogues. For the demagogue has been the great strangler of civilization. Both Greek and Roman civilizations fell at the hands of this loathsome creature who brought from Macaulay the remark that "in every century the vilest examples of human nature have been among the demagogues." But a man is not a demagogue simply because he stands up and shouts at the crowd. There are times when this can be a hallowed office. The real demagogy of the demagogue is in his mind and is rooted in his irresponsibility towards the ideas that he handles—ideas not of his own creation, but which he has only taken over from their true creators. Demagogy is a form of intellectual degeneration. "The will of the nation" is one of the phrases most generally abused by intriguers and despots of every age. The vote has not always served as the defining feature of democracy. As strange as it may seem to moderns, Aristotle considered election to be an oligarchic or aristocratic element in government.3 As Aristotle noticed, even in regimes with no property qualifications for citizenship or office, wealthier citizens tend to dominate elected positions. The philosopher thus identified democracy not with the act of voting but rather with popular control of the courts, the absence of a property qualification for citizenship, the use of the lottery to fill public offices, and the rule of the poor in their own interests.4 Nor was Aristotle's view completely idiosyncratic. Since even nondemocratic classical Greek poleis used votes by the citizen body to select at least some important officials or to determine policy, the Greeks understandably did not see voting itself as a defining quality of demokratia. Nevertheless, most moderns consider the casting of ballots in free elections the defining element of democratic government, and the Athenians did make policy and choose fellow citizens for particular state offices through votes in an assembly open to all citizens. Analysis of their electoral practices thus offers us a potential analogue for modern regimes. By Athenian reckoning, Pericles held not only the official position of strategos, but also the informal place of rhetor (political orator), making proposals in the council and assembly and thus acting as what the Athenians would later call a demagogos (plural, demagogoi), literally a "leader of the demos." The Athenians initially seem to have used the term demagogos without pejorative intent, and it has been well said that the so-called demagogues served a necessary function in the Athenian regime.6 Such men served not merely as the voices of various political interests but also as remarkably free critics of the very populace they sought to influence. That is, the best demagogoi attempted to change popular opinion and thus, as Thucydides puts it in his praise of Pericles, to lead the people "rather than to be led by them" (2.65). Indeed, since the term demagogos explicitly denotes someone who leads or shepherds the demos, the eventual use of this word as the primary epithet for a political panderer represents a virtual reversal of its original meaning.7 The word demagogos in fact implies that the people need someone to lead them and that political power, at least in part, is exercised appropriately through this leadership. After the mid fifth century, payment for public service served as a fundamental and defining characteristic of Athenian democracy.12 In the years following Pericles' innovation, it undoubtedly became increasingly difficult for a leader opposed to this use of public money to win out over Pericles and his supporters. Although many Athenians were willing to consider ending payment for public service beyond the military (at least temporarily) as late as 411,13 after the Peloponnesian War and the discredited oligarchic regimes of 411 and 404 (which had curtailed state pay), only proposals to increase public payments seem to have had political viability in Athens. That these conditions encouraged the rise of what we call "demagogues" is entirely comprehensible. In an environment where a public figure can help secure his own election to office or the success of his legislation by proposing the distribution of more public money to a large enough portion of the electorate, and where there is no strong feeling among the populace that such a distribution is shameful or morally wrong, leaders proposing increased payments possess a tremendous advantage over their opponents.14 Nevertheless, Athenian government did not collapse immediately after the institution of public payments, nor did the Athenians immediately vote themselves into public bankruptcy. Indeed, not until the 420s do we begin to see evidence of the potentially harmful effects of these practices. The election of leaders represents only one of the important votes cast by members of the Athenian assembly. As we have noted, the citizen assembly also acted as a court, policy-making body, and sovereign legislature, limited in authority (until the late fifth century) only by itself and deciding the most important issues of the state, including issues of war and peace. Under this system, to vote was to rule one's neighbor in a very direct and public fashion. By raising his hand in the assembly, a citizen openly demonstrated his own desire to make war or peace, to tax other men's property, to impose rules on his fellow citizens, or to elect a corrupt person to office. But again, most Greek city-states had citizen assemblies or councils in which members of the citizen body voted on at least some important matters. What made Athens's system odd was its payments for public service and its low property requirements for full citizenship, both of which encouraged greater participation by the common people in political decision-making and administration. Most Greek poleis in the classical period seem to have had property qualifications for full citizenship. These qualifications apparently tended to coincide roughly with the amount of property necessary to enable someone to provide his own weapons and thus serve in the citizen militia of hoplites. Similar property qualifications were also common in the United States, even after the Revolution and the ratification of the Constitution.17 Thus economic limitations on full participation in the political life of a regime are not inconsistent either with the ancient Greek ideals of eleutheria and isonomia ("liberty" and "equality of the law") or with the principles embodied in the American Constitution. All prospective Athenian officials, whether chosen by election or by lot, faced the same or similar questions before either the Council of 500 or a regular Athenian court. This vetting process (dokimasia) served to test the candidate's formal qualifications and personal conduct, not his supposed technical competence for a particular office.31 Any citizen could make accusations against a candidate during the dokimasia, and such accusations could result in the candidate's rejection (by vote) before the examining body. Rejections may have been rare; we know of only a few cases from the classical period.32 But even if candidates rarely failed to pass their examinations, the questions put to hundreds of Athenians each year by their fellow citizens made a strong public statement about the values of the demos and the duties expected of each Athenian. In contrast to citizen rights in modern America, the privileges of citizenship in ancient Athens carried with them serious responsibilities and duties. Before the mid fourth century, these duties meant that most Athenian men at least occasionally risked their lives in military service. Athenians also expected their fellow citizens to maintain standards of personal conduct in order to retain their privileged status, and they could withhold privileges (such as office-holding) or impose punishments for failure to meet these expectations. Obviously, therefore, Athens's removal of property qualifications for citizenship does not indicate that the Athenians set no standards for participation in the sociopolitical life of the polis. The citizens of Athens continued to perform public and private duties and meet standards of personal conduct in exchange for their citizenship throughout classical Athenian history. Did the Demos Rule Well? Although the Athenians continued to insist on personal qualifications for citizenship, they did remove most economic restrictions on participation in the polis's government. Those without property could participate in the Athenian assembly and sit on Athenian juries. Many Athenians apparently had confidence in the poorer citizens' ability to rule wisely through voting. Pericles claimed that the common members of Athens's electorate—the whole demos—were "not insufficiently knowledgeable" in public affairs and that all Athenians were "either able to originate or, at least, to judge policies astutely" (Thuc. 2.40).40 Indeed, the principle that all men received justice (dike) in equal shares from the gods and thus could act as "capable judges" in public matters (including trials) seems to have been one of the ideas used to justify democratic government.41 But does an evaluation of classical Athenian history bear out this proposition? Did the Athenian citizens in assembly tend to make just or wise decisions about ruling themselves and others? Surely any honest critique of democracy must confront this basic question: do the people rule well? The major events of Athenian history are rarely examined as expressions of the Athenians' electoral justice, wisdom, or skill. Perhaps this stems from the fact that, if one treats Athens's actions as the results of ballots cast by a free people in assembly, Athenian history makes a poor argument for popular rule. Athens's history under demokratia shows the Athenian people voting repeatedly to make war on their former friends and allies (as well as enemies), to conclude alliances with their recent enemies or with Greeks that had collaborated with Persia, to execute or exile their own leaders, to extort monetary payments from allied states that wished to be free of Athenian hegemony, to use this extorted money to fund Athenian projects (including the extortion of more money), to impose their own form of government on formerly autonomous states by force, to execute and enslave thousands of non-Athenian Greeks, to invade foreign states with massive force in order to expand Athenian power, to usurp or undercut taxes formerly paid by foreign citizens to their own states, to require religious oaths of loyalty from their allies, to refuse requests for assistance from allied states or to send only token or mercenary forces to these allies, to continue and even increase state payments to themselves in the face of pressing need elsewhere, to refuse to help other Greek states resist Macedonian hegemony, and to grant honors to the very dynasts who imperiled their form of government. All this, again, resulted from majority votes in the Athenian assembly. Of course, we may attempt to balance these expressions of the popular will by juxtaposing them with the Athenian votes to send aid to the Ionian Greeks during their revolt from Persia (499), to stand against the Persians at Marathon and Salamis (490, 480), to crush the Persian forces in southern Asia Minor at the Eurymedon (ca. 466), to assist their Spartan allies during a helot revolt (462/1), to reestablish demokratia (in 410), to stand (at last) against Philip of Macedon (in 339/8), and to honor citizens, foreigners, or other states that had done good services for Athens. But it would certainly be difficult to construct a list of praiseworthy or wise Athenian votes in the classical period that could rival in number those ballots that to many moderns (and at least some ancient Greeks) have seemed unjust, belligerent, or simply foolish. Moreover, most of the Athenian assembly's more admirable decisions appear very early in the period of demokratia, before the radicalization of the regime in the late 460s. After that time, very few votes of the demos reflect anything but a rather narrow view of Athens's (or rather, individual Athenians') self-interest.42 In fact, after the vote in 462/1 to assist Sparta during the helot revolt, we rarely see the Athenians voting to support policies that could not be painted as profitable for the citizens or the city. With the creation of the Delian League in 478/7, the Athenians entered a new period, in which their assembly was called upon repeatedly to make decisions about their empire and the fate of non-Athenian Greeks and others encountering Athens's power. Scholars differ on the extent to which the Athenian assembly governed the alliance in its early years. Thucydides reports that the league had its own congresses (1.96), and thus the allies presumably had some say in league affairs in the years just after 478/7. Once we come to the 440s, we reach the period of Pericles' clear dominance of the Athenian political scene.53 Although we know of only a few particular decrees proposed by the statesman after the citizenship law of 451/0, his name or influence are associated with many of Athens's most famous or infamous acts in this period.54 We also know the names of some of the other Athenian leaders who made significant proposals before the people in this period, because they are included as part of the prescript of the Athenian inscriptions that record the assembly's decrees. Virtually all these documents begin with the same basic formula. Although the dates of many of these inscriptions remain controversial, there is general agreement that at least some of them go back to the 440s (and earlier), and that they thus reflect the period of Periclean leadership in Athens.56 Given the popular association of Pericles and Athens with the ideals of humanism and democracy, these documents would seem particularly troubling. For in them we have recorded on stone not the dictates of an emperor or tyrant to his subjects but rather the decrees of a free people in assembly, an assembly including (if not dominated by) the poorest members of Athenian society. It is rarely emphasized that each inscription records an actual vote of the Athenian people: that is, each directly reflects the Athenian popular will (or rather the will of the majority present at a given meeting of the assembly). Each of these documents thus presents a snapshot of the Athenian electorate, and the image preserved is often less than flattering. From one of the earliest examples of Athenian rule (and several that follow), we see that the Athenians voted to impose their own form of government on other Greek states, to install garrisons in other cities, and to require particular religious sacrifices of their subjects.57 The Athenian demos also voted to create colonies on foreign soil and to send out Athenian settlers to occupy lands formerly owned by others.58 In their assembly, the Athenians voted to reduce their revolted allies and to force them to swear oaths of loyalty to the Athenian demos, and sometimes even to swear "to love the demos of the Athenians. "59 A majority of the Athenians decided that certain legal disputes involving Athenians and their subjects should be heard in Athens by Athenian jurors, rather than locally, where non-Athenians would make decisions.60 The demos threatened and imposed fines and other punishments on foreign allies and on Athenian officials who failed to fulfill their duties.61 Indeed, it would seem that the Athenian demos voted to threaten and punish their fellow citizens (with fines, exile, execution) as frequently as their foreign subjects. Athenian hegemony and imperialism—whatever we think of them—flourished in the environment created by democratic government. At the same time that the Athenians were voting to impose their form of government on and exact tribute payments from formerly autonomous regimes, they were voting to pay themselves from public funds and erect fabulous new buildings.62 Of course, the people who cast their votes are only one side of this equation. The options that they have are partially restricted by the leaders they support, and thus an examination of the most famous and admired of Athens's democratic leaders would seem in order. Pericles casts a long shadow. Undoubtedly the most important figure in the history of Athenian democracy, he nonetheless suffers from mythologization similar to that which has colored modern Americans' opinions about George Washington and Abraham Lincoln. The legends surrounding these men arguably shroud adequate popular appreciation of them as real human beings and political figures. The disaster of George Washington's reputation is demonstrated almost every year when I ask my students, "What did George Washington do?" The answer is immediate and disturbing: "He chopped down a cherry tree." Even the moral of the children's story ("I cannot tell a lie. . . . ") has been obscured by the humorous image of young George wielding his trusty hatchet, presumably making an early start on the construction of his wooden teeth. Many fifth-century Greeks would have expected nothing else. After all, what would have been more bizarre than if the Athenians had actually chosen to build a temple showing Athens as merely one part (or even the leading part) of a larger Greek confederation, or making Athena merely one god within the Hellenic pantheon? Instead, Pericles and the Athenians sang their own praises and those of their goddess.71 Some other Greeks undoubtedly did not approve of the Athenians' dominant position in the Aegean, but all understood it, and many of those who visited Athens must have admired the beauty and magnificence of Athenian art and architecture, no matter how they had been funded. A close examination of Pericles' Funeral Oration in Thucydides reveals a monument perhaps an even more "nationalistic"—as opposed to "democratic"—than the Parthenon. After briefly dilating on Athens's open society and implicitly contrasting this with the control of individual lives putatively found in Sparta, Pericles passes quickly to the issue of Athens's power and the need for Athenian citizens, literally, to become "lovers" of the city or its power.72 Even Pericles' famous proclamation that Athens was a school, or "education" for Greece, rests on a military foundation. Such ideas are echoed later in the last speech of Pericles presented in Thucydides' work. Pericles' speeches and career thus provide important evidence of the Athenians' martial self-image and of their early efforts to conceptualize their polis—but only in part—as a state with an unusual and superior government/society (politeia). Nevertheless, and despite his crucial role in the radicalization of Athenian democracy, Pericles himself has attracted relatively little scholarly attention in the past few decades. One suspects that this stems in part from his semi-mythologized character, which makes a "book about Pericles" appear to be a less than completely scholarly enterprise.76 In fact, grappling with the problems of Pericles' biography, his political career, and his long-term influence must be central to any study of Athenian history in the second half of the fifth century. But Pericles' great-uncle Cleisthenes seems to have fallen from power shortly after the reform that created demokratia, perhaps because his government sought Persian protection in the face of possible Spartan interference in Athenian internal affairs. (The Spartans, having removed the Peisistratid tyrants, had returned to Athens and attempted to overthrow the regime instituted by the Peisistratids' relation Cleisthenes. The Athenian people successfully resisted their attempt, but then rejected an alliance with Persia apparently supported by Cleisthenes. )79 Later, Pericles' Alcmeonid relatives found themselves under suspicion of pro-Persian sympathies. After the battle of Marathon they were accused of collaboration with the Persian invaders, and Alcmeonids and those close to them were ostracized by vote of the Athenian demos.80 Included in this banished group were Pericles' father, Xanthippus (who was married to an Alcmeonid), and his Alcmeonid uncle Megacles. Pericles thus spent important adolescent or early adult years during the mid to late 480s as the son of an exile, probably returning to Athens with his father only after those ostracized had been recalled in 481/0. While many have studied or cited limited sections of these speeches as examples of "democratic" values, the orations as a whole have rarely been examined carefully as documents of Pericles' thought (in part because of the question of Thucydides' involvement in their composition). But at worst they represent what Thucydides thought people would believe Pericles had said or might have said, and they are therefore, even on the minimalist view, the reflection of an acute contemporary observer's opinions about Pericles' ideas. In short, Pericles apparently believed that individual Athenians' contemplation of their state's future reputation (as opposed to their own personal safety or honor) actually should comfort citizens suffering from the loss of their children and bolster their morale in the face of a war now aggravated by the outbreak of a deadly plague. Yet the statesman perhaps somewhat overestimated the Athenians' willingness to sacrifice themselves for the sake of history, since the people eventually fined him. Nevertheless, taken as a whole, Pericles' career demonstrates his ability to sell his conception of Athens to the demos. As Thucydides put it, Pericles was able to lead the people, and thus to persuade them to take unpopular actions. Fifth-century Athens is praised as the cradle of democracy and sometimes treated as a potential model for modern political theory or practice. In this daring reassessment of classical Athenian democracy and its significance for the United States today, Loren J. Samons provides ample justification for our founding fathers' distrust of democracy, a form of government they scorned precisely because of their familiarity with classical Athens. How Americans have come to embrace "democracy" in its modern form—and what the positive and negative effects have been—is an important story for all contemporary citizens. Confronting head-on many of the beliefs we hold dear but seldom question, Samons examines Athens's history in the fifth and fourth centuries B.C. in order to test the popular idea that majority rule leads to good government. Challenging many basic assumptions about the character and success of Athenian democracy, What's Wrong with Democracy? 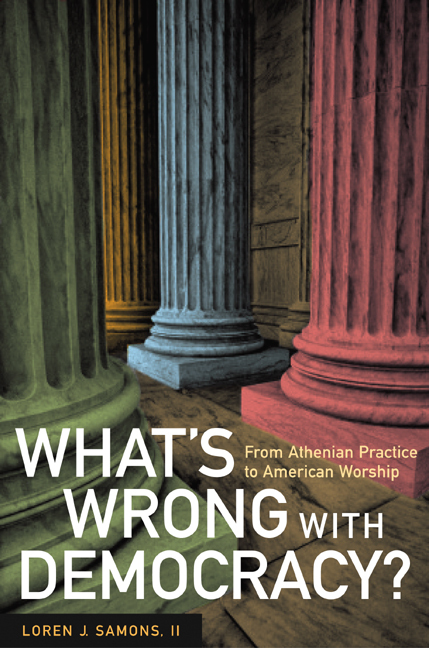 offers fascinating and accessible discussions of topics including the dangers of the popular vote, Athens's acquisitive foreign policy, the tendency of the state to overspend, the place of religion in Athenian society, and more. Sure to generate controversy, Samons's bold and iconoclastic book finds that democracy has begun to function like an unacknowledged religion in our culture, immune from criticism and dissent, and he asks that we remember the Athenian example and begin to question our uncritical worship of democratic values such as freedom, choice, and diversity. Loren J. Samons II is Associate Professor of Classical Studies and Associate Dean for Students, College of Arts and Sciences, Boston University. He is author of Empire of the Owl (2000), editor of Athenian Democracy and Imperialism (1998), and coauthor, with Charles W. Fornara, of Athens from Cleisthenes to Pericles (California, 1991).